The annual general meeting approved the annual report, the annual financial statements, the consolidated 2016 financial statements and the distribution of a gross dividend of CHF 3.75 per nominal share. The dividend will be distributed on May 9, 2017. The assembly granted discharge to all members of the board of directors and the members of the executive board for financial year 2016. 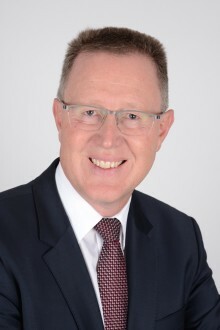 Furthermore, the assembly renewed the authorized share capital in the unchanged amount of CHF 300,000 for another two years and amended the articles of association accordingly. 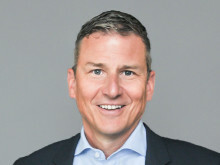 Dirk Reich, a Swiss and German national, was elected as a new member of the board of directors. Roger Schmid had decided not stand for re-election. All other members of the board of directors were re-elected for another one-year term of office. In an advisory vote, the assembly endorsed the 2016 compensation report. The proposed maximum compensation of the board of directors up until the 2018 annual general meeting and of the executive board for financial year 2018 was likewise approved. The compensation committee and the independent proxy were elected as proposed by the board of directors. Finally, Deloitte AG was electedas statutory auditor for financial year 2017. The next annual general meeting is scheduled for May 8, 2018. 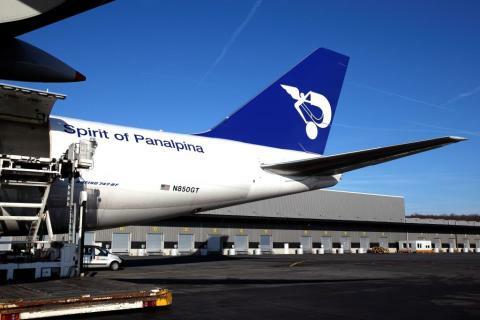 At the annual general meeting of Panalpina World Transport (Holding) Ltd., held on May 8, 2018, 65.47% of the share capital was represented. All proposals of the board of directors were approved by a clear majority and Sandra Emme was confirmed as a new member of the board of directors. ​Panalpina’s board of directors proposes to elect Sandra Emme as a new member of the board at the upcoming Annual General Meeting (AGM), to be held on May 8, 2018. She would succeed Chris Muntwyler who will not stand for re-election. 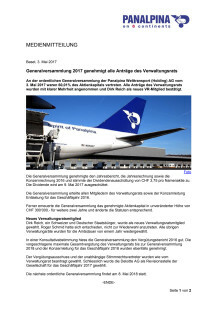 An der ordentlichen Generalversammlung der Panalpina Welttransport (Holding) AG vom 3. Mai 2017 waren 60,01% des Aktienkapitals vertreten. Alle Anträge des Verwaltungsrats wurden mit klarer Mehrheit angenommen und Dirk Reich als neues VR-Mitglied bestätigt.